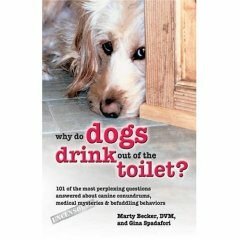 Why dogs drink out of the toilet? SUMMARY: List of did-you-know’s about dogs. AUDIENCE: The book is aimed at dog owners (i.e. not specifically for a professional audience), after a sensible answer to their dog’s million and one quirks. REVIEW: I very much enjoyed reading this one, to my great surprise, as I had bought it more as an airport read than anything else. It is structured as a series of Q&A’s. The questions are often interesting, and the answers are well-balanced (even when covering controversial topics) and well-researched. Ideal myth buster for the curious dog owner. Browse the Book Review archive. Genre: pop science. Book Authors: Becker Marty, Spadafori Gina. Reading Level: Owners. Star: 4. Bookmark the permalink. Post a comment or leave a trackback: Trackback URL. You are here: Home » Book Reviews » Why dogs drink out of the toilet?